Click here for instructions describing how to use the deadline calculator. Remember to double check the results here with your own calendar. While this calculator may be a useful tool, it is extremely important to do your own independent date calculation. The date calculator software provided is offered “as is.” Court Deadlines does not take into account the unique scheduling requirements of your case. Also, it goes without saying that you should always familiarize yourself with the relevant rules in your jurisdiction. If you have questions about a court deadline, consult the clerk or court coordinator assigned to your case for information about any specific deadlines. 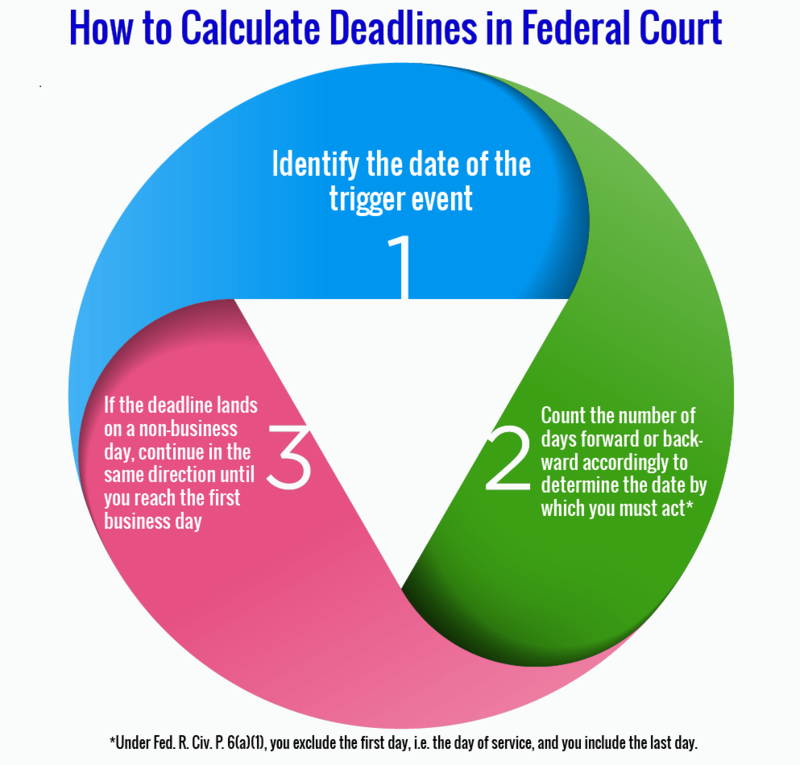 How do I Calculate Deadlines in Federal Court? First, identify the date of the trigger event (e.g., the date of service or the hearing date for a motion). Count the number of days forward (e.g., from the date of service) or backward (e.g., from the hearing date) accordingly to determine the deadline by which you must act (i.e., the deadline to file an answer to the complaint or serve discovery responses). If the deadline lands on a non-business day, continue in the same direction until you reach the first business day thereafter. Time periods stated in “days” are calendar days. Accordingly, count the days, including intermediate Saturdays, Sundays, and legal holidays. The date of the trigger event is excluded. Therefore, if you are counting forward from today, then today is day zero, tomorrow is day one, and so forth. When the due date falls on a weekend or legal holiday, keep going until you reach the next business day. If you are counting forward from a trigger event, continue moving forward until you reach the next business day. If you are counting backward from a trigger event, continue moving backward until you reach a business day. Electronic filings are due by midnight of the due date. Manual filings are due before the clerk’s office closes. Federal holidays are listed here. Check your court’s local rules for additional information about recognized holidays. Certain methods of service, such as service by mail or by leaving a document with the clerk, entitle a party to additional time to act. Bankruptcy courts have their own set of rules, which can be found online.